I came across the title above, “The Worst Hard Time,” while sorting used book donations at the local library. The cover looked strange, a white border around a shrunken cover image. What kind of book looks like that? 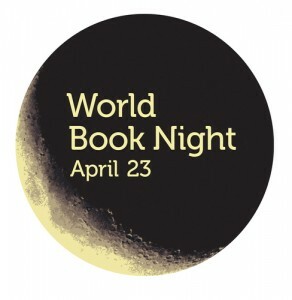 I studied the book briefly and noticed the “World Book Night U.S. 2013” at the bottom of the front cover. The back cover, also on a nondescript white background, listed “The World Book Night U.S. titles for 2013,” with a list of titles that ranged from Mark Twain to Tina Fey. My volunteer co-workers, were equally perplexed by the unusual book cover, so I volunteered to research the mystery. The list of participating publishers includes a venerable who’s who in the publishing industry. The organization itself is registered as a 501(c)(3) non-profit. The chosen books range from classics to modern-day bestsellers, so the publishers are definitely not holding back. The 2014 picks contains yet another impressive array of authors and titles. I can’t say that I’m exactly a target for the World Book Night give-away, as I am reading all the time and have ready access to books. 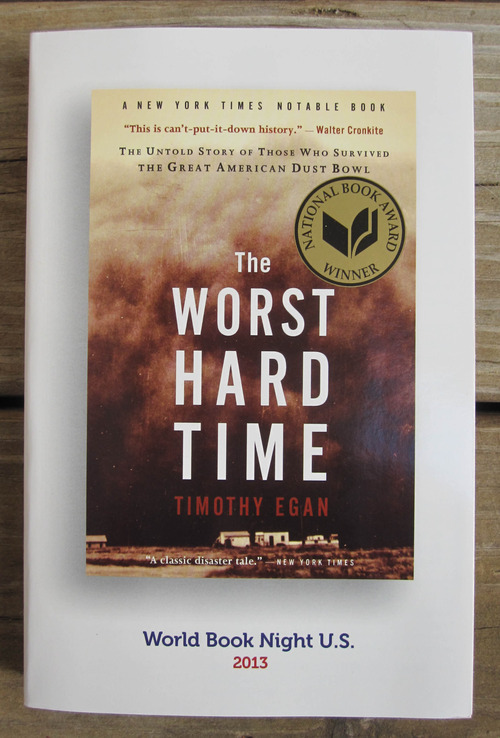 However, after reading “The Worst Hard Time,” a National Book Award winner, I sure am glad that the title crossed my path in the library sorting room. It was one of the best-researched books I have ever read, and I now know a lot more about the Oklahoma and Texas pan-handles during the Great Depression than I had ever imagined. Somewhere, there’s a volunteer from the World Book Night who is smiling. This book has actually been sitting in my TBR pile for several months–you may have inspired me to move it up to the top! The Grapes Of Wrath is one of my favorite classic novels, and I bought this book because I was interested to see how it would compliment the Steinbeck title. I’d heard of World Book Night, but never knew the background. Interesting! You won’t be disappointed! “The Grapes of Wrath” is one of my favorite books, too. “The Worst Hard Time” mentions the classic a few times, so having read it helps in understanding the era. I’m ashamed to say that there were a lot of things about the Dust Bowl that I really had never heard about before reading the “free” book.